Another great Trixie mystery. I live not far from Marietta, so it was fun reading about places that I'm familiar with. Once again, a dead body shows up where Trixie is, which sends her on a quest for a killer. Deborah pens great cozy mysteries. This one is no exception. Can't wait for the next one. Nice easy readI needed something to 'cleanse the palette ' and this was great. These ladies are hilarious and the mystery was interesting. 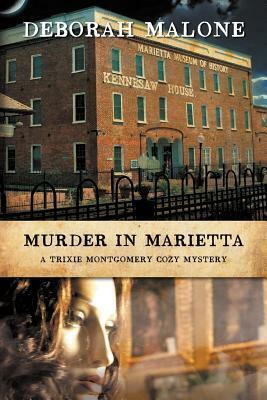 MURDER IN MARIETTA Deborah Malone	Protagonist Trixie Montgomery is a reporter for Georgia By The Way Magazine, whose editor, Harv has assigned her to investigate mysterious, unexplainable occurrences involving theft, smoke odor, and ghosts reported to the police from the Marietta History Museum personnel and guests. Trixie isn’t real happy about being chosen to be a ghost catcher, but the fact is she needs a paycheck and she needs her colorful dreams to alleviate, so she agrees to spend one night in the museum with her best friend, DeeDee, and make up something for the boss. However, the museum curator, Doc, finds a dead body while the women are in the building. So the curator, Trixie and DeeDee all become suspects to the murder of Jacob, who is the president of the board of directors. Nana, Trixie’s great Aunt brings her best friend, Dora to see the museum when Dora happens to break her hip falling down and is shipped to the hospital. Nana needs intravenous southern fried greasy chicken fixes between supporting Dora and helping Trixie and DeeDee find the correct culprit and have them recognized as innocent. Ms. Monroe has done a lovely job of inserting passages of Marietta building history and relating them to the present. It’s a classic cozy/mystery that leaves nothing out—murder, red herring suspects, frightening experiences that seem to have no explanation, period balls, complete with the fun of old ladies wrestling with hoop skirts.Sprinkled throughout the story are traditional southern homilies such as “tick on a hound dog,” “quicker than a southern girl could say ‘well bless her heart,’” etc. Typically, Murder In Marietta is a squeaky clean novel of a romp in old parts of Georgia. If you want a cozy with a mystery, clean fun, outrageous characters with a little history thrown in, this is it. Such a fun read. I truly enjoyed Trixie, Dee Dee and but especially Nana. I can only imagine how much fun these gals would be to know in real life. The author does a good job creating a visual of not only the characters but the scenery and museum. I really liked this book until the last chapter. Everything seemed to get wrapped up too suddenly. Deborah Malone - Deborah Malone's first novel, "Death in Dahlonega," finaled in the American Christian Fiction Writer's Category Five writing contest! Deborah was nominated for 2012 and 2013 Georgia Author of the Year Award in Novel category. Deborah has worked as a freelance writer and photographer, since 2001, for the historical magazine “Georgia Backroads.” She has had many articles and photographs published during this time. Her writing is featured in “Tales of the Rails” edited by Olin Jackson as well as the magazine, "Christian Communicator." She is a member of Georgia Writer's Association and Advanced Writers and Speaker's Association. As a current member of American Christian Fiction Writers she has an established blog where she reviews Christian Fiction.